At year’s end most jazz reviewers and journalists are almost obliged to select some sort of top ten list, chronicling their selections for the best music of the previous year. This is so subjective as to border on the absurd. Nonetheless it does offer those, who haven’t had a chance to listen to some of the music, a little insight into what one reviewer may believe to be some of the best music he or she has heard over the past year. Naturally you can’t comment on what you haven’t listened to, and therein lies the inherent flaw in the process. Who can possibly listen to everything that is released? This is especially true with the onslaught of self produced cds by up and coming artists and delusional wanabe’s who can now afford to produce their own albums. What is a conscientious reviewer to do? My particular niche is listening to artists who may not be fully established, not necessarily in the mainstream of media coverage and/or established artists that transmit something particularly poignant, entertaining or inspired with their music. To this end I offer, in no particular order, my list of music that I have found particularly fetching this year. I hope for some of you it opens up awareness to these fine artists and that you will find their work compelling enough to support their efforts by purchasing their music. Happy Holidays to you all and enjoy. Best vocal album of the year was for me a runaway. California based Denise Donatelli’s second collaboration with the talented pianist and arranger Geoffrey Keezer titled “When Lights are Low” was the standout. Here is the link to my review of this fine album. Dave Frank teaches in his New York studio. He has established an unbelievably consistent left hand walking bass line that defies convention and in the process has delved into territory that to my knowledge has not being explored by any other pianist of note since Dave McKenna or Lennie Tristano. Check out his latest offering “Portraits of New York” here. Two "live" performance albums had some terrific moments. The Walter Smith III Quartet “Live in Paris” featured some fantastic interplay between the young tenor of Smith paired with the inventive trumpeter and rising star Ambrose Akinmusire. Check out the review here. The other “live” album of note was soprano saxophone master Dave Liebman’s Big Band live “ As Always” which was played on the college circuit, in front of appreciative audiences. My review of Liebman’s big band effort can be read here. Saxophonists had some fine offerings this year and some of my favorites included George Brooks’ with drummer Steve Smith on “Spirit & Spice” , which had some wonderful collaborations with Indian master musicians and created a really compelling world album sound that had fusion overtones. Check it out here. Veteran saxophonist Charles Lloyd put together a fetching album of music titled “Mirror” Joined by a young group of musicians that were perhaps together formed his most sympathetic group since his days with Keith Jarrett, Cecil McBee and Jack DeJohnette. They included pianist Jason Moran, the bassist Reuben Rodgers and the drummer Eric Harland. One the surprises of the year came from educator and saxophonist Ralph Bowen on his energetic cd “Due Reverence” which was a dedication to some of his inspirations. The dynamic group was superlative, with bassist John Pattitucci, drummer Antonio Sanchez and guitarist Adam Rodgers. Bowen’s superb articulation is par excellant and his facility is superb. A seemingly unknown talent to the general public, Bowen is teaching in New Jersey at Princeton and Riutgers, and if this album is any indication, is destined for wider acclaim. Link here to my review. “Three for All” was a, fiery, refreshing and inspired offering from earlier this year and my review can be seen here. Helio Alvez. Click here for my review. Bob Sheppard. Most surprisingly it was Collangellos’ subtle bass work and his fine compositional acumen that made this one special. My review can be seen here. For those who love Brazilian music the authenticity of Morello & Barth’s “Fim De Semma Em Eldorado” was a sensuous treat. Some stirring vocals by legends Johnny Alf and Alaide Costa were the icing on this South American treat. My review of the album can viewed here. A quirky album that caught my ear for its shear originality and the distinctive, bluesy guitar playing of Charlie Hunter was Ben Goldberg’s “Go Home” . It offered a deft mix of sounds and ethnic influences that somehow worked like magic. Check it out here. My love of the music of John McLaughlin and the Mahavishnu Orchestra was sated by a unique big band album that featured ex-Mahavishnu drummer extraordinaire Billy Cobham, in collaboration with a German band known as the HR Big Band on the album “Meeting of the Spirits” . The orchestrations and the vibrant musicianship demonstrated that this music has the depth and beauty that transcends the power of the original band, and proves that John McLaughlin’s compositions are timeless. You can view my review here . Have a wonderful holiday and please support and enjoy the music. 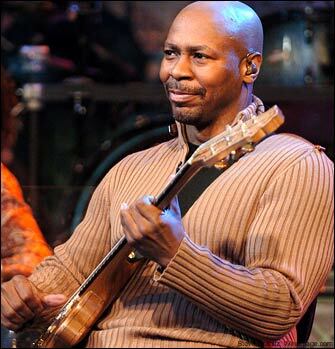 Review of Guitarist Kevin Eubanks' comeback album " Zen Food"
It is always a little edgy for an established artist to leave a prominent commercial gig and venture back to his jazz roots. 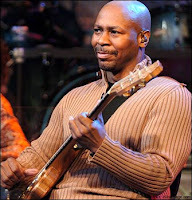 In this case, guitarist Kevin Eubanks had previously worked with Art Blakey, Slide Hampton, Dave Holland and Sam Rivers, so his credentials were never in question. But Kevin’s real notoriety comes from being the visible, nightly foil and bandleader on Jay Leno’s Tonight Show, He took over these duties from the saxophonist Branford Marsalis back in 1992 and has been holding the lead seat ever since. in Los Angeles before taking the show on the road. On "Spider Monkey Café”, Eubanks’ builds upon a modern, oscillating theme that he intertwines with a secondary vamp played by Pierce on soprano and Gerry Etkins on keyboard. He then solos with a traditional hollow body electric sound, creating an effective juxtaposition of sounds that has shades of Montgomery-type octave playing in it. Perhaps the funkiest song on the album, and one that I find wonderfully engaging, is “The Dirty Monk”. Eubanks’ guitar sound is appropriately nasty sounding. Etkins pays some lowdown blues on his ivories and Pierce’s tenor is gutsy and soulful. Smith on drums and Rene Camacho on bass hold down the bottom and keep the rhythm in overdrive. “Adoration” is a fanciful duet that has Eubanks finger picking on acoustic guitar with Etkins playing a candy coated Rhodes keyboard that I frankly could have done without. The driving “Los Angeles” is a aural depiction of the frenetic pace of Eubanks' hometown. On the first part of the song, Eubanks' plays rhythm guitar over a probing tenor line from Bill Pierce and Marvin “Smitty” Smith’s fusillade of drums. 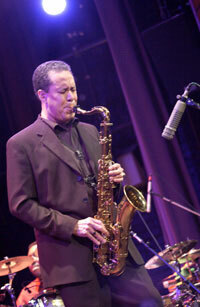 When Eubanks does solo he is at his most fluid, playing some of his the most free and creative lines on the album. a tender ballad that is a predominantly a duet between Eubanks’ skillfully sustained guitar notes played over Etkins piano accompaniment. Etkins solo piano is at his most elegant and thoughtful on this number. finds the band really playing in a joyful groove that keeps you snapping your fingers. Eubanks seems most facile on a tune that has a heavily defined groove. From here on out the album seems to lose its vitality and originality for the remaining cuts. The droning “G.C" and the uninspired “Offering” are incomplete to me and offer little to remember, with the exception of a McCoy Tyner-like homage by Etkins at the end of the later. “Das It” is a fleet fingered exercise between Eubanks and Smith that closes the album. Despite some disappointments mostly as the album trails off, this offering is entertaining, generally steeped in a catchy groove and well executed. Eubanks’ is a talented guitarist and with offerings like “Spider Monkey Café” and “ The Dirty Monk” he is well on his way back to re-establishing himself as an important voice in the jazz guitar lexicon. Musicians: Kevin Eubanks (electric and acoustic guitars); Marvin “Smitty” Smith (drums); Bill Pierce ( tenor and soprano saxophones); Gerry Etkins (acoustic piano, Rhodes and organ) ; Rene Camacho (bass). (here is a link to his article http://www.nytimes.com/2010/11/29/arts/music/29brubeck.html?_r=1&ref=nate_chinen) and talked of Brubeck being more economical saying “he had softened his pianism, replacing the old hammer-and-anvil attack with something almost airy…”. On this evening, I found Mr. Brubeck’s playing to be deliberate and joyful. He has certainly tempered his percussive side, perhaps as a means to sustain energy, but to no less effect. He lifted his hands high above the keyboard at times, evoking anticipation of his next choice of note or phrase, almost giving himself pause to reflect on the possibilities. During several passages his playing was elegant and fluid, but his role has shifted from centerpiece soloist to orchestrator and consummate accompanist. He was accompanied by his polished rhythm section of Michael Moore on bass and Randy Jones on drums. Along with the mellifluous saxophonist Bobby Militello, the trio did most of the heavy lifting during the concert. Mr. Brubeck was helped on stage to tumultuous applause from the adoring audience. The audience was amazingly diverse with many younger patrons accompanying their parents or friends for this once in a lifetime event. 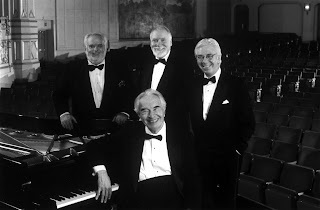 The quartet went through a mostly familiar repertoire including a medley of Duke Ellington’s “Duke’s Place” and "Take the A Train” which featured some sensitive bowing by Mr. Moore, the obligatory “Take Five”, with Mr. Jones taking an extended drum solo, ala Joe Morello, as Mr. Brubeck stood at his piano watching, “Forty Pieces” and a beautifully sensitive “Elegy” where Mr. Brubeck showed he hasn’t lost his sense of lyricism. He did his own take on the 1924 theme song from Fred Waring and The Pennsylvanians, a tune called “Sleep” where Militello played a gorgeous flute solo that was pristine in its clarity. Mr. Brubeck was at his most elegant on his Gregorian Chant inspired variation on "Pange Lingua". The highlight of the evening was when the audience started to spontaneously erupt into "Happy Birthday" a cappella to the surprised Mr. Brubeck, who was prodded into playing it along with his band mates ( a first he said) as the audience stood singing. Later in the evening, he was presented with an official birthday cake from Jazz Forum Arts. He playfully got some icing on his new suit, a suit he joked was new twenty years ago. It was an evening to remember for both Mr. Brubeck and his grateful audience. Based on his vitality at the keyboard, we will have him around to ply his magic for many years to come. For those who want a good overview of Mr. Brubeck's career check out Clint Eastwood's "In Your Own Sweet Way" to be featured this Monday night December 6, 2010 on the Turner Classic television station at 8 PM. Here is a clip from Dave's classic quartet from 1966 on Duke's "Take the A Train"